This booklet tells you how to use the R software to carry out some simple analyses that are common in bioinformatics. In particular, the focus is on computational analysis of biological sequence data such as genome sequences and protein sequences. This booklet assumes that the reader has some basic knowledge of biology, but not necessarily of bioinformatics. The focus of the booklet is to explain simple bioinformatics analysis, and to explain how to carry out these analyses using R.
To use R, you first need to start the R program on your computer. You should have already installed R on your computer (if not, for instructions on how to install R, see How to install R). Many authors have written R packages for performing a wide variety of analyses. These do not come with the standard R installation, but must be installed and loaded as “add-ons”. Bioinformaticians have written several specialised packages for R. In this practical, you will learn to use the SeqinR package to retrieve sequences from a DNA sequence database, and to carry out simple analyses of DNA sequences. Some well known bioinformatics packages for R are the Bioconductor set of R packages (www.bioconductor.org), which contains several packages with many R functions for analysing biological data sets such as microarray data; and the SeqinR package (pbil.univ-lyon1.fr/software/seqinr/home.php?lang=eng), which contains R functions for obtaining sequences from DNA and protein sequence databases, and for analysing DNA and protein sequences. The National Centre for Biotechnology Information (NCBI) (www.ncbi.nlm.nih.gov) in the US maintains a huge database of all the DNA and protein sequence data that has been collected, the NCBI Sequence Database. This also a similar database in Europe, the European Molecular Biology Laboratory (EMBL) Sequence Database (www.ebi.ac.uk/embl), and also a similar database in Japan, the DNA Data Bank of Japan (DDBJ; www.ddbj.nig.ac.jp). These three databases exchange data every night, so at any one point in time, they contain almost identical data. Each sequence in the NCBI Sequence Database is stored in a separate record, and is assigned a unique identifier that can be used to refer to that sequence record. The identifier is known as an accession, and consists of a mixture of numbers and letters. For example, Dengue virus causes Dengue fever, which is classified as a neglected tropical disease by the WHO. by any one of four types of Dengue virus: DEN-1, DEN-2, DEN-3, and DEN-4. The NCBI accessions for the DNA sequences of the DEN-1, DEN-2, DEN-3, and DEN-4 Dengue viruses are NC_001477, NC_001474, NC_001475 and NC_002640, respectively. Note that because the NCBI Sequence Database, the EMBL Sequence Database, and DDBJ exchange data every night, the DEN-1 (and DEN-2, DEN-3, DEN-4) Dengue virus sequence will be present in all three databases, but it will have different accessions in each database, as they each use their own numbering systems for referring to their own sequence records. 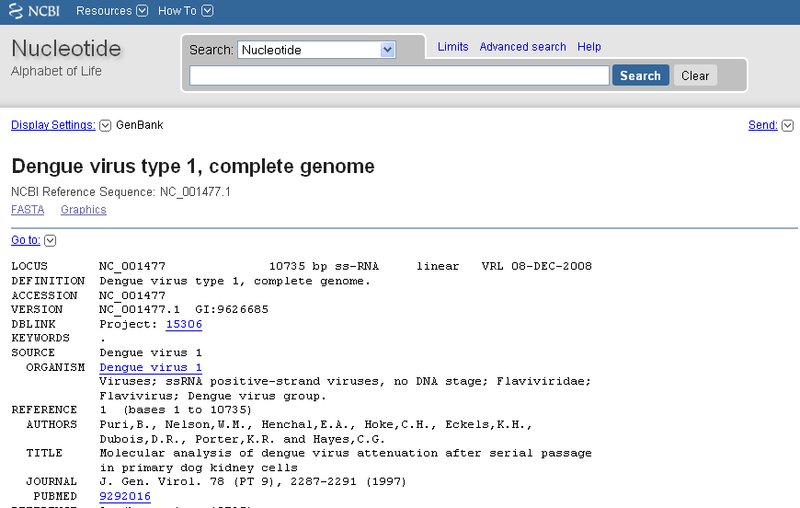 You can easily retrieve DNA or protein sequence data from the NCBI Sequence Database via its website www.ncbi.nlm.nih.gov. To retrieve the DNA sequence for the DEN-1 Dengue virus genome sequence as a FASTA format sequence file, click on “Send” at the top right of the NC_001477 sequence record webpage, and then choose “File” in the pop-up menu that appears, and then choose FASTA from the “Format” menu that appears, and click on “Create file”. Instead of going to the NCBI website to retrieve sequence data from the NCBI database, you can retrieve sequence data from NCBI directly from R, by using the SeqinR R package. "a" "g" "t" "t" "g" "t" "t" "a" "g" "t" "c" "t" "a" "c" "g" "t" "g" "g" "a"
 "c" "c" "g" "a" "c" "a" "a" "g" "a" "a" "c" "a" "g" "t" "t" "t" "c" "g" "a"
 "a" "t" "c" "g" "g" "a" "a" "g" "c" "t" "t" "g"
Note that dengueseq[1:50] refers to the elements of the vector dengueseq with indices from 1-50. These elements contain the first 50 nucleotides of the DEN-1 Dengue virus sequence. If you have retrieved a sequence from the NCBI database using the “getncbiseq()” function, you may want to save the sequence to a FASTA-format file on your computer, in case you need the sequence for further analyses (either in R or in other software). You can write out a sequence to a FASTA-format file in R by using the “write.fasta()” function from the SeqinR R package. The write.fasta() function requires that you tell it the name of the output file using the “file.out” argument (input). You also need to specify the R variable that contains the sequence using the “sequences” argument, and the name that you want to give to the sequence using the “names” argument. Using the SeqinR package in R, you can easily read a DNA sequence from a FASTA file into R. For example, we described above how to retrieve the DEN-1 Dengue virus genome sequence from the NCBI database, or from R using the getncbiseq() function, and save it in a FASTA format file (eg. “den1.fasta”). Note that R expects the files that you read in (eg. “den1.fasta”) to be in the “My Documents” folder on your computer, so if you stored “den1.fasta” somewhere else, you will have to move or copy it into “My Documents”. 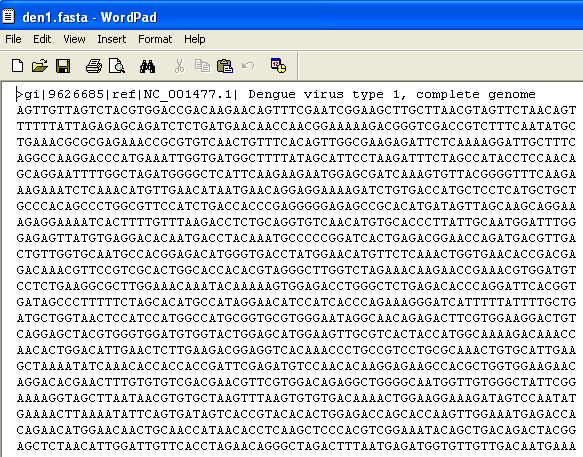 Now the variable dengueseq is a vector containing the nucleotide sequence. The length() function will give you back the length of the sequence stored in variable dengueseq, in nucleotides. The length() function actually gives the number of elements in the input vector that you pass to it, which in this case in the number of elements in the vector dengueseq. Since each element of the vector dengueseq contains one nucleotide of the DEN-1 Dengue virus sequence, the result for the DEN-1 Dengue virus genome tells us the length of its genome sequence (ie. 10735 nucleotides long). This means that the DEN-1 Dengue virus genome sequence has 3426 As, 2240 Cs, 2770 Gs and 2299 Ts. One of the most fundamental properties of a genome sequence is its GC content, the fraction of the sequence that consists of Gs and Cs, ie. the %(G+C). The GC content can be calculated as the percentage of the bases in the genome that are Gs or Cs. That is, GC content = (number of Gs + number of Cs)*100/(genome length). For example, if the genome is 100 bp, and 20 bases are Gs and 21 bases are Cs, then the GC content is (20 + 21)*100/100 = 41%. Alternatively, if you are feeling lazy, you can use the GC() function in the SeqinR package, which gives the fraction of bases in the sequence that are Gs or Cs. The result above means that the fraction of bases in the DEN-1 Dengue virus genome that are Gs or Cs is 0.4666977. To convert the fraction to a percentage, we have to multiply by 100, so the GC content as a percentage is 46.66977%. As well as the frequency of each of the individual nucleotides (“A”, “G”, “T”, “C”) in a DNA sequence, it is also interesting to know the frequency of longer DNA “words”. The individual nucleotides are DNA words that are 1 nucleotide long, but we may also want to find out the frequency of DNA words that are 2 nucleotides long (ie. “AA”, “AG”, “AC”, “AT”, “CA”, “CG”, “CC”, “CT”, “GA”, “GG”, “GC”, “GT”, “TA”, “TG”, “TC”, and “TT”), 3 nucleotides long (eg. “AAA”, “AAT”, “ACG”, etc. ), 4 nucleotides long, etc. Note that by default the count() function includes all overlapping DNA words in a sequence. Therefore, for example, the sequence “ATG” is considered to contain two words that are two nucleotides long: “AT” and “TG”. The command above extracts the third element of the table produced by count(dengueseq,1), which we have stored in the table variable denguetable. table() for printing out a table of the number of occurrences of each type of item in a vector or list. These functions belong to the standard installation of R.
Some links are included here for further reading. For background reading on DNA sequence statistics, it is recommended to read Chapter 1 of Introduction to Computational Genomics: a case studies approach by Cristianini and Hahn (Cambridge University Press; www.computational-genomics.net/book/). For more in-depth information and more examples on using the SeqinR package for sequence analysis, look at the SeqinR documentation, http://pbil.univ-lyon1.fr/software/seqinr/doc.php?lang=eng. There is also a very nice chapter on “Analyzing Sequences”, which includes examples of using SeqinR for sequence analysis, in the book Applied statistics for bioinformatics using R by Krijnen (available online at cran.r-project.org/doc/contrib/Krijnen-IntroBioInfStatistics.pdf). For a more in-depth introduction to R, a good online tutorial is available on the “Kickstarting R” website, cran.r-project.org/doc/contrib/Lemon-kickstart. There is another nice (slightly more in-depth) tutorial to R available on the “Introduction to R” website, cran.r-project.org/doc/manuals/R-intro.html. Thank you to Noel O’Boyle for helping in using Sphinx, http://sphinx.pocoo.org, to create this document, and github, https://github.com/, to store different versions of the document as I was writing it, and readthedocs, http://readthedocs.org/, to build and distribute this document. Many of the ideas for the examples and exercises for this chapter were inspired by the Matlab case studies on Haemophilus influenzae (www.computational-genomics.net/case_studies/haemophilus_demo.html) and Bacteriophage lambda (http://www.computational-genomics.net/case_studies/lambdaphage_demo.html) from the website that accompanies the book Introduction to Computational Genomics: a case studies approach by Cristianini and Hahn (Cambridge University Press; www.computational-genomics.net/book/). Thank you to Jean Lobry and Simon Penel for helpful advice on using the SeqinR package. The content in this book is licensed under a Creative Commons Attribution 3.0 License. Answer the following questions, using the R package. For each question, please record your answer, and what you typed into R to get this answer. Model answers to the exercises are given in Answers to the exercises on DNA Sequence Statistics (1). Q1. What are the last twenty nucleotides of the Dengue virus genome sequence? Q2. What is the length in nucleotides of the genome sequence for the bacterium Mycobacterium leprae strain TN (accession NC_002677)? Note: Mycobacterium leprae is a bacterium that is responsible for causing leprosy, which is classified by the WHO as a neglected tropical disease. As the genome sequence is a DNA sequence, if you are retrieving its sequence via the NCBI website, you will need to look for it in the NCBI Nucleotide database. Q3. How many of each of the four nucleotides A, C, T and G, and any other symbols, are there in the Mycobacterium leprae TN genome sequence? Note: other symbols apart from the four nucleotides A/C/T/G may appear in a sequence. They correspond to positions in the sequence that are are not clearly one base or another and they are due, for example, to sequencing uncertainties. or example, the symbol ‘N’ means ‘aNy base’, while ‘R’ means ‘A or G’ (puRine). There is a table of symbols at www.bioinformatics.org/sms/iupac.html. Q4. What is the GC content of the Mycobacterium leprae TN genome sequence, when (i) all non-A/C/T/G nucleotides are included, (ii) non-A/C/T/G nucleotides are discarded? Hint: look at the help page for the GC() function to find out how it deals with non-A/C/T/G nucleotides. Q5. How many of each of the four nucleotides A, C, T and G are there in the complement of the Mycobacterium leprae TN genome sequence? Hint: you will first need to search for a function to calculate the complement of a sequence. Once you have found out what function to use, remember to use the help() function to find out what are the arguments (inputs) and results (outputs) of that function. How does the function deal with symbols other than the four nucleotides A, C, T and G? Are the numbers of As, Cs, Ts, and Gs in the complementary sequence what you would expect? Q6. How many occurrences of the DNA words CC, CG and GC occur in the Mycobacterium leprae TN genome sequence? Q7. How many occurrences of the DNA words CC, CG and GC occur in the (i) first 1000 and (ii) last 1000 nucleotides of the Mycobacterium leprae TN genome sequence? How can you check that the subsequence that you have looked at is 1000 nucleotides long? © Copyright Avril Coghlan, Licence: Creative Commons Attribution 3.0 License. Created using Sphinx 1.5.3.